The head of the City regulator has admitted meeting oil giant Saudi Aramco over a potential £1.5 trillion listing on the London Stock Exchange. Andrew Bailey, chief executive of the Financial Conduct Authority (FCA), said discussions with the world's biggest oil firm were held early this year. The regulator has been criticised for proposing changes to listing rules to accommodate sovereign-owned companies. MPs have warned about lax governance and political interference in the deal. Mr Bailey said: "We can confirm that we held conversations with Saudi Aramco and their advisers in light of their interest in a possible UK listing in the early part of this year. "We emphasised during those conversations that we were reviewing the listing regime." Mr Bailey was writing in response to a letter from Nicky Morgan, chair of the Treasury Committee. 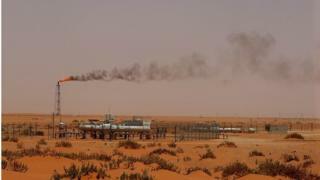 Saudi Aramco plans to list 5% of its shares in London or on another major stock exchange, but UK rules state that more than 25% of shares should be listed to stop a single shareholder having too much influence. However, FCA proposals put forward in January could allow for exceptions. In a letter sent last week in defence of the FCA's suggestions, Mr Bailey said: "We do not think protections for investors will be weakened. "We have previously made clear publicly that we will permit lower percentages than 25%, where the value and distribution is such that there can be a liquid market." What's the fuss about Saudi Aramco and the London market? However, Ms Morgan said that "questions remain about the level of political involvement in the consultation". "The UK's world-class reputation for upholding strong corporate governance mustn't be watered down," she added. Her comments come as the government seeks to demonstrate that the UK is a good place to invest as Britain prepares to leave the European Union. Rachel Reeves, chair of the Business, Energy and Industrial Strategy committee, said: "What may well be good for City traders is not necessarily good for the rest of the country's economy or investors. "It is not at all clear how taking these steps will boost jobs, investment or returns to investors in the UK," she added.